I love being a missionary! There is something about the feeling you get when your investigator, someone you love, lights up when you tell them they will see their families and be with them forever. We shared the plan of Happiness with Dave, a man whose wife and daughter were killed in a car crash 5 years ago. It was as if I was an instrument in God's hands as I soothed this man's pain and sorrow. There can be no greater joy or satisfaction than the knowledge that death is not the end. That we will hold our loved ones after this life in the presence of our loving Heavenly Father. I ask you to get on your knees and sing praises to your God in gratitude for the family you've been given. There is no greater gift. As I am away from my family I have noticed my prayers on their behalf getting longer and more fervent. This work has been instilled in my heart, how great a blessing our family is. On Tuesday Elder Bednar came and spoke again. His goal was to answer some more of the questions we asked on Christmas. The feeling that accompanied this meeting was the same, if not more powerful than when he came on Christmas. What an incredible blessing to have an apostle of the Lord come to speak to us not once, but twice in the MTC. On Wednesday we had the opportunity to be hosts. It was an incredible priviledge to welcome all these new missionaries. It was really quite the day! We had nearly 400 missionaries come into the MTC at once! It was really special to see this army come forth with such joy and enthusiasm in their eyes! Yesterday we had infield orientation. It really brought home the reality that I am entering the field in three days! I feel so honored to serve both state side and in Brazil. I will make both Tuscon and Santos my "holy land". I already cherish the people. I know that God has prepared people for me to find. I make a promise now: I will rely on my God like everything depends on Him and I will work like everything depends on me. I will work until I can work no more and then I will work some more. I cherish the people the Lord has prepared for me, and I will do anything it take to find them and serve them. I have been waiting so long for the day when I can walk into the world with Christ's name on my chest and help my brothers and sisters remember who they are. Never forget that in Baptism you promised to take His name upon you, and you make that promise each week in the sacrament. When you walk into the world, pray for eyes to see those who need your loving help. Pray for ears to hear the silent cries of those around you that need you to lift them up. And pray for a mouth to speak the words that shall be a comfort to those in need. God sends angles to help His children. You are one of His earthly angels. You can be the answers to someone else's pleas for help. Please do not forget this. Your brothers and sisters need YOU. Please don't turn them away because you think that you are the only person struggling. I challenge each of you to pray for an opportunity to serve those that need you. Another day in the life of a missionary has come and gone. It’s a new year and I plan to use it to the best of my ability to meet the will of my Father. Sunday was another day full of blessings. I am feeling 100% better since I got sick. The bronchitis is gone. Thank you of your prayers, I know they have helped a ton! I've been reading the Book of Mormon a lot lately. As I read through the teachings of King Benjamin I’ve learned a lot about myself. You should all read his words in Mosiah Ch. 2-5. As the new year has begun I challenge you to pick a way that you can apply his teachings to your life. I am going to strive to be more charitable than I have ever been before. Charity is the true love of Christ. I know as you make your own resolution and approach it with humble and sincere prayer, Heavenly Father will multiply and expand your efforts. I know that if you fall short, you can recommit yourself each day and as you do so, I know that you will be blessed beyond what you could have imagined for yourself. Thank you all for your love and support. I know this calling is not easy or convenient, but I know it will be worth it. I love you all so much! I will keep going because I have your love to lift me up. On Sunday we watched the John Tanner movie that Grandma and Grandpa Culley showed us a few years back. I told my district that I am a descendant of John Tanner. Everyone made the connection (except for me) that my companion is a descendant of Parley P. Pratt. Him and John Tanner were called on missions at the same time. It’s like a spiritual inception and now, their descendants are companions on a mission together. We were called on the same day, just like them! Pretty amazing huh! Dear Elder must have closed down for the Holidays because I was flooded by Dear Elder’s on Monday. It was a joyous occasion! So I will try to respond to those all at once. I am just going to have to suppress the thought that Mom has a freaking HUGE gun! In response to one of your questions, I love hearing about all the silly little details of your lives, it helps me to feel close to all of you. Everything I write is for each one of you…. But I should take my own advice more often. You mentioned Keegan Hicks in your letter. I met him here on Christmas Day. He told me to tell Riley that he says “hi” and to write him. So Riley, if you aren’t going to do homework, you should write Elder Hicks. He seemed really happy here. I was surprised that he recognized me. He waved me down in the hall. I would love if you sent me that letter that he wrote on Christmas. I am sorry that I wasn’t there to take down Christmas decorations! NOT! Haha! Just kidding though, you would be surprised how much the little things mean to me now that I’m away. I am glad that TJ is doing well. Tell him I said “Hi”! And Mom, don’t go adopting more kids just because I’m not there. Ha ha! It might be a little too much to come home to another sibling sleeping in my bed. On more thing, I want to hear all about Zoe. I miss her so dang much. I sleep with an extra pillow because I can’t sleep without her. You better be walking her. In scripture study today I came across Mosiah ch 25:10, it says, “when they thought of the immediate goodness of God and His power…. They did raise up their voices and give thanks to God”. God’s blessings are immediate. When we experience a gift of God or notice His hand working in our lives, are we raising up our voices and giving thanks to God? We are given miracles everyday. Each time we are given a miracle, we need to OPEN OUR MOUTHS! Open your mouth in prayer, open your mouth to those around you, tell them how you are blessed and how they can notice their blessings too. Spread that light of Christ in the lives of the people around you. THE GIFTS OF GOD ARE IMMEDIATE… THEY MAY NOT BE WHAT WE PLANNED, BUT THEY ARE BETTER. OUR GRATITUDE SHOULD BE JUST AS IMMEDIATE! The past week has been a huge struggle for me here in the MTC. #MTCstruggles I am sick with Bronchitis, yet I continue to go to every study, class and devotional. I am also really struggling with the language and homesickness over Christmas. If you get a minute, look these up! They completely change my perspective. I am super blessed! I (feel really blessed to have people like him in my life that are always turning outward. I hope I can be as Christ-like as him one day. My trials are Heavenly Fathers way of humbling me and making me stronger everyday. I am so blessed! Sunday we went on another temple walk in the beautiful snow! It's so fun to see the missionaries who have never seen snow, experience the best snow on earth for the first time! Our District is always having fun together, but more importantly we feel the spirit so strongly when we work hard. They always know just how to help me through my trials. On Sunday I asked for another blessing from Elder Visser. My testimony of the Priesthood has been strengthened since being here. It truly is God's power on this earth! I felt an incredible peace come over me. I still have bronchitis, the language is still hard, but I am able to bear those trials which God has asked me to bear. And I testify that trials are an opportunity for us to turn to God and we will be strengthened in Him. I also testify that you are ALWAYS worthy of God's love and forgiveness. You may feel at times that you are inadequate or too low to ask for God's help, but that is when He most wants to lift us up. And I promise you that He will do just that as you turn to Him in prayer and to His words in the scriptures. He will bless you as you turn outwardly to serve those around you. He loves you and He will make your paths straight if you will trust in Him. Do not be discouraged; the Lord has great blessings in store. Blessings greater than we can imagine for our selves, as we turn unto Him! NEVER BE AFRAID TO CALL UPON YOUR FATHER IN HEAVEN! YOU ARE HIS AND HE IS YOURS! YOURS TO TURN TO ALWAYS! So basically my companion is incredible! I had really been struggling with being so sick, so we stayed back at the residence during gym time so I could sleep. And instead of being bitter, my companion said something that will stay with me the rest of my life. She said, "God must have something great in store for you, Sister Culley. After all this trouble with your VISA, you getting sick and being discouraged by the language I've realized Satan must be really scared of you. I think he sends his best soldiers after the strongest missionaries. But you just keep trooping." I freaking love her! I know that I will get to Brazil. I know that I will speak the language. And when I do Satan better watch his back! He can't hold me back because I have God on my side! Christmas eve was a lot of fun! We ran out of time in class so Sister Pratt and I didn't get to teach our new investigator, Belmiro. It was kind of a bummer because we planned this really awesome lesson about Christmas and the savior! The dinner wasn't our usual prime rib, but it was pretty good. Stir fry and egg rolls... ha ha not very Christmassy if you ask me! Afterward we watched two Christmas movies: the story of Christ's birth an Mr. Kruger's Christmas. This Christmas has been really Christ centered for me. It's incredible! I may not have my own family near me, but I have my second family, my district! I can feel your love and prayers in my behalf! keep it coming! I'm gonna need it! I am so blessed to have all of you back at home! I miss you all so much, but I am so filled with joy that I get to be with you for eternity! We woke up on Christmas morning to our shoes filled with goodies. Then we went to Breakfast and off to EMAILING! for twenty minutes. It was so hard to say goodbye to all of you! I had missed you so much! Elder Bednar came to speak to us for Christmas. It was incredible they passed out cell phones to everyone and we texted Elder Bednar our questions and he answered them at the pulpit. Although he never got to my question, while he was talking my question was answered anyway! Such a cool experience! I feel incredibly blessed to be here for the Holidays serving my Redeemer. I've missed you guys so much! But like I've said a million and one times, I am so blessed to have an ETERNAL FAMILY! I know that no matter what I face, I can overcome it with the love of my eternal family. After we heard Bednar speak we went to lunch. Afterwards we went to a Jazz concert! a really good jazz band came and played a whole bunch of Christmas music for us. it was a lot of fun. What was cool about the band was that they were improvising most of what they were doing! So cool! That night we went back to our classroom and read Christmas stories and ate everyone's goodies. It was a lot of fun!! I love the MTC! I love you! Or is she at Hogwarts? K just to clarify the portuguese phrase I wrote on my envelope meant "God created families to make us happy!!!" Jeeze epic fail on google translator! I love the MTC! It's basically hogwarts! Oh my Lanta! I love the MTC! It's just like Hogwarts! There is totally magic here! We have the great hall, or the cafeteria. We have gryffindor tower, or 17M (my residence hall). Our district is totally Gryffindor! ha ah there are "secret" passage ways everywhere! (more like I'm still getting lost after 10 days) We have hogsmead or the bookstore. And we have the MTC gates just like the Hogwarts gates. And best of all everyone says we have angels and spirits fighting off the devil all around the MTC, so It's like the magic surrounding Hogwarts to protect it. We also have to have "passwords" to get into all the buildings. (aka our swipe cards). It's like all my dreams are coming true! Oh and we all got "Hogwarts" letters! :) LOVE IT! Thank you for the packages! My district loved them! and the Berries are AMAZING! and the Better Cheddars are a gift from heaven!! I will try to give you a heads up on when I will be emailing on Christmas so we can chat! So I'm just going to give you one monster journal entry, sorry if you've heard it before, but I don't know what I've told to who! Saturday was Dermival's second lesson! and It went so well! we taught him how to pray and then he agreed to pray WITH us! It was such a big step for him! I am so filled with joy for him and his family! and on wednesday Dermival said that he wanted to be BAPTIZED! What an amazing blessing! Even though I only speak broken portuguese, the spirit spoke to Dermival in a way that I couldn't have even in English! It has been hard to be away from my family. I miss my mom's hugs and my dad's words of encouragement. I miss Levi's nonsense and Riley's jokes. But I am so grateful that I will have that for eternity. And that's why I'm out here! So others can have what I have been so blessed to have forever! 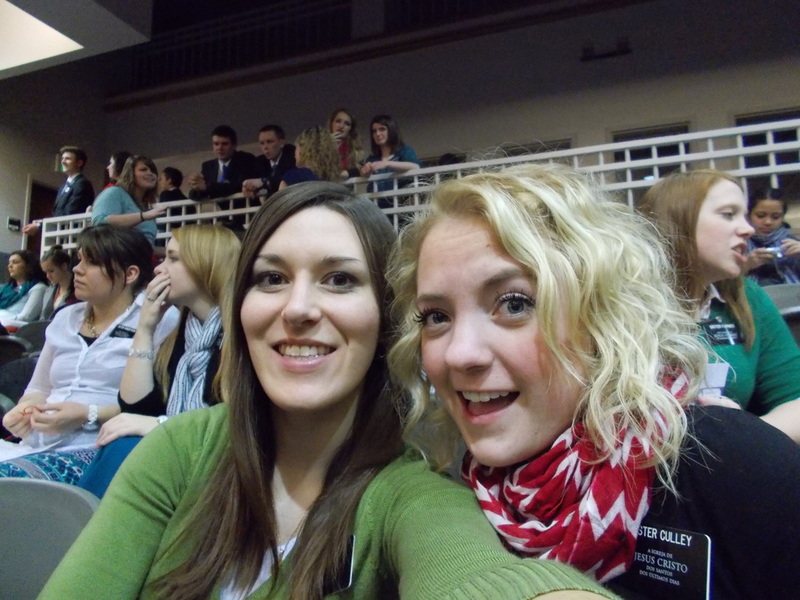 My first Sunday in the MTC we went to the spoken word broadcast with all the sisters in our zone! It was their special Christmas broadcast that you guys went to! so It's like we went together! It made me think of all the people at home and what they must be doing. I'm gonna miss our game of hide and seek. There was a guy in the program that looked exactly like Austin Russell! I had to do a triple take! Keep me in your prayers. my district is leaps and bounds ahead of me in learning the language. But i know that Heavenly Father answers prayers! We got to leave the gates on Sunday! After sacrament meeting we got to go on a temple walk to the provo temple. 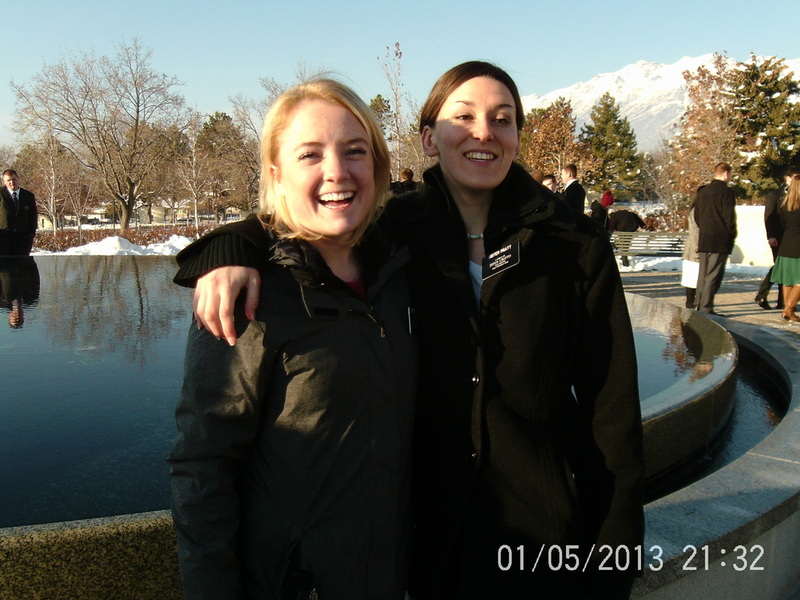 It was sunny and beautiful, with the glistening snow it lifted my heart to the angel moroni! We took pictures and laughed! It was so great! And you'll never guess what else I did on Sunday! I joined a choir! ha ha not only that, but we performed in Tuesday night's devotional! And it shocks me every time my companion tells me I have a good voice! Our district just continues to grow closer and closer! Tuesday night after the devotional we shard our own spiritual gifts and bore our testimonies. I'd like to take a minute to do so here: I know that my redeemer lives and loves each one of us. I have felt his love for me and I know that Christ went below it all. He experienced the deepest pit of sorrow, but no just that. He experienced YOUR deepest pit of sorrow. He spoke your name a syou cried out for help. He carressed your face as you were brought to your knees. He cheered and tears stained his cheeks as he witnessed you triumph over death itself. He has felt it ALL. I have the spiritual gift of a testimony of the savior, and I challenge you to seek the same. His love is POWERFUL! I say these things in the name of Jesus Christ, Amen. Tudo Bem?? Eu eston muito Bem! Entering the MTC is the experience of a lifetime! I hope… more like wish that everyone could have it. Even it it is just walking in the doors. I imagine it is what Riley must feel like when he walks onto the football field. As I walked away from you all it broke my heart! I couldn’t look back, or I might not have kept going. It reminds me of the scripture, “He who puts his hand to the plow and looks back is not fit for the kingdom of God” but as I put one foot in front of the other, all the missionaries lining the sidewalks began to cheer. I think this is what it will feel like when we walk through the concords of angels and into the arms of our Savior. I have never felt so pumped! As soon as I entered the front doors of the MTC all doubts or questions of my purpose or my adequacy left my mind. I then went through a whirl wind of people giving me things and asking me questions. Somewhere in that confusion a sister pinned on my badge and said, “you now represent Christ, welcome to the MTC”. OH BOY! Then I went to my residency, dropped off my bags and my host, sister Calder, dropped me off at my classroom (where we spend ALL of our time)! My district is 54. I was the first sister to arrive (surprise, surprise) so it was just me and a group of elders and our professor for the day. Later on I met my companion, sister Pratt, she is from Missouri and is 19. 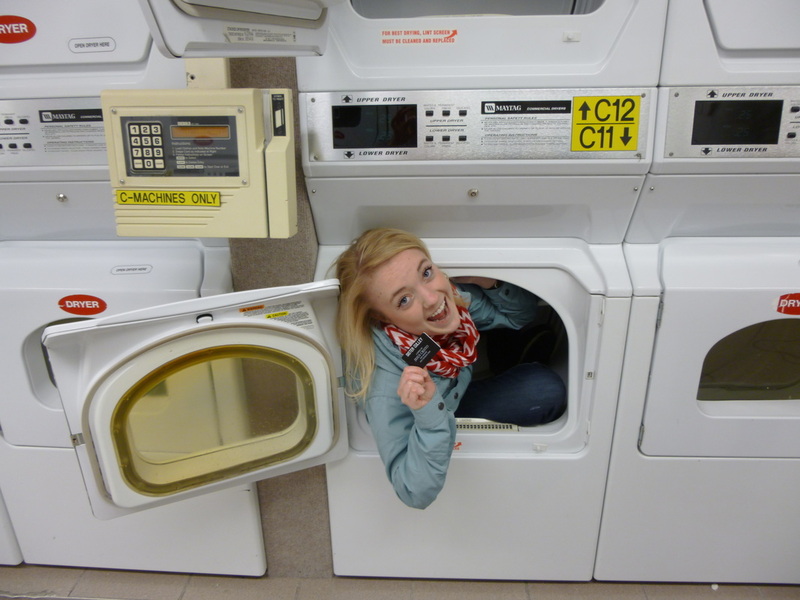 She went to BYU and she is awesome! MUITO OTIMO! She is able to keep me on point and she is almost as big a tom boy as me, so we get along really well. That night we went as a large group to teach 3 separate investigators. SO AWESOME! (in English) I bore my testimony to the first investigator, Sarah, about the Love of God and Happiness that comes from following Christ. I also bore my testimony and conversion story to her. She pulled me aside afterward and said “thank you” and seemed really interested in me. The investigators here are employees of the MTC, but I’m treating them like they are real. The other investigator that I loved was George. He is an amputee veteran of the Army. He is a professional artist and we talked a ton about art. We didn’t really get around to having a gospel discussion, but I made a friend and that’s all that really matters. Thursday we met our Branch Presidency. Everyone in our district gave their testimonies and it was super powerful. Friday has been my favorite day so far. We had a lot more personal and companion study time. But my favorite part was teaching mine and sister Pratt’s first investigator, Dermival. We taught in Portuguese and I’m not even sure what was being said or what I said. Afterward our district (4 sisters and 6 elders) had two hours of extra time and we decided to have a testimony meeting in Portuguese. It really brought the spirit and brought us closer. I asked a blessing from our district leader, Elder Burg, because my hip was hurting worse than it had for a really long time. It’s from the billions of flights of stairs. But afterward I felt so comforted and by later that night I felt completely better. The priesthood is God’s power (poder) on earth! I feel so blessed to have the district that I do. They all make me laugh, which is so important in the MTC! Being too serious could make you depressed so easily. Okay, tell me everything that’s going on at home. Ri, how was the dance? Levi, how did your concert go? How was the family Christmas party? I love my 12 days of Christmas. Send me pictures and write me using “dear elder” or snail mail so that I can get mail. The only mail I’ve got is a package that the Buxton’s sent and Mom’s dear elder. I love you all so much and miss you like crazy! Give Zoe a kiss for me and WALK HER!